Texas has plenty of iconic images, from its distinctive shape to the longhorn cattle that once grazed its plains to its highway signs warning “Don’t Mess With Texas.” So giving your prefab log cabin a Texas-themed flavor can be easier than you might think. Here at Leland’s Cabins, we love to celebrate all things Texas, so we’re offering up our top five favorite decorating ideas to put you in a Lone Star state of mind. Texas earned the Lone Star State nickname from the design of its flag as the Republic of Texas, which was a sovereign state from March 2, 1836, to February 19, 1846. The flag is immediately recognizable: horizontal bars of white over red on the right side, with a vertical blue stripe to the left that features a single white star. Not only can you find the Lone Star on the state seal and the state flag, but on items for all around the house. Tea towels, coasters, clocks, drinking glasses. One of our top picks for setting a Texas tone at your cabin—whether as a getaway in the woods or an office in your backyard—is a Lone Star door knocker from Texas Traders out of College Station. Made of iron and featuring a horseshoe for good luck, it’s a simple nod to the state’s cowboy roots and fierce independence. Speaking of cowboys, Texas is still alive with ranches, rodeos, and Western traditions that trace back centuries. And there’s no lack of honoring this history with horses, cattle, and cowpokes on household items for every room in your cabin. You can find Western images printed on thick throw blankets, door mats, and pillows. But one of the best items to feature in your cabin is cowboy-themed dinnerware. Choose from bucking broncos to longhorn steer to boots—and there’s even Christmas-themed plates and dishes too. Sellers like True West Home out of Royse City, Texas, offers patterns that are designed and illustrated by a cowboy artist—Till Goodan—whose original art dates back to 1943 and 1964. Dining on your Western dishes might feel like the most natural thing in our Lone Star, Chisholm Trail, and The Ponderosa cabins, whose names alone evoke Texas culture. In fact, any of our nine prefab log cabin models celebrate the Lone Star State since each one is Texas made with quality craftsmanship. At Leland’s, we demonstrate our commitment to the planet by planting 20 trees for every cabin we sell. We believe this more than offsets the wood we use to build a cabin. So we’re excited by businesses that create new home furnishings out of reclaimed wood to create beautiful kitchen islands and countertops, doors, and custom furniture. Places like the Reclaimed Wood Shop in Houston recover lumber from places like dilapidated barns, factories, and churches. At Hawkins Furniture Co. in Rosenberg, their wood comes from old Texas bowling alleys and dancehalls. From this reclaimed wood, these designers create one-of-a-kind Texas wood tables, bookcases, and more that incorporate a bit of Lone Star history into your prefab log cabin home. Weathered and full of memories, each piece they make comes with its own story—and becomes part of yours. Some say bluebonnets are to Texas what the shamrock is to Ireland, and we don’t think that’s too far from the truth. Bluebonnets are another important icon to Texas living, and featuring bluebonnets in your Texas log cabin will add color and vibrancy to your interior no matter the season outside. Artists across the state have painted and photographed bluebonnets. Check out galleries and retailers who spotlight Texas artists, and pick up a print or original. Texas Crazy features bluebonnet watercolors and oil paintings, while Cooper Glass out of Austin showcases stained glass art of bluebonnets. Put your Texas prefab log cabin on the map with wall art of the Lone Star State. 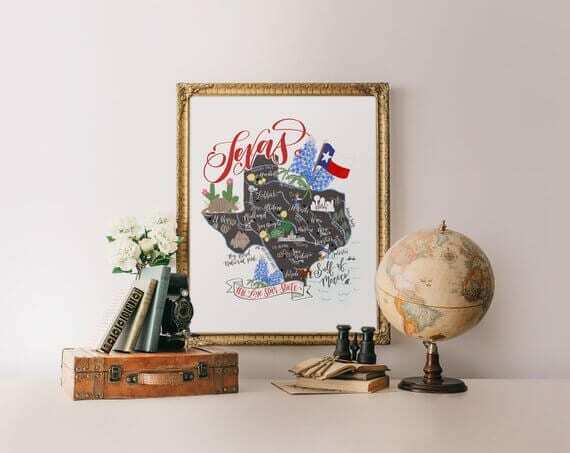 Whether going with a whimsical map of Texas like ones made by Wylie-based Printable Wisdom on Etsy or historical renderings created by the Texas Map Store out of Bulverde, a map can make a statement on your cabin walls. Our favorite is the 1881 Lonesome Dove trails map that celebrates early Texas history. But a close second is the more contemporary, handmade map of Texas popular icons. No matter how you choose to decorate your Texas manufactured cabin, you know you’ll move into a solidly built, well-crafted home when you start with Leland’s Cabins. Visit our showroom in Grandview, Texas, and walk through all nine of our models. Open the cabinets and doors, step through the bedrooms and kitchens. We don’t think it will take too long before you begin imagining what it will be like to sit down to supper and where you’ll hang your hat. Contact Leland’s today, and let us help make the cabin of your dreams become a reality.